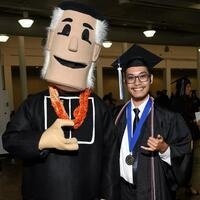 The Commencement Ceremony will be held on Monday, December 10, 2018 at 7:00 p.m. at the Neal Blaisdell Arena, located at 777 Ward Avenue, Honolulu, Hawaii 96814. Families and friends are welcome to attend this event in recognition of all graduating students. The event is FREE and no tickets are required. Parking at the Arena is $7. The ceremony is estimated to last 2 hours. The ceremony will be broadcast on ‘Olelo 54.